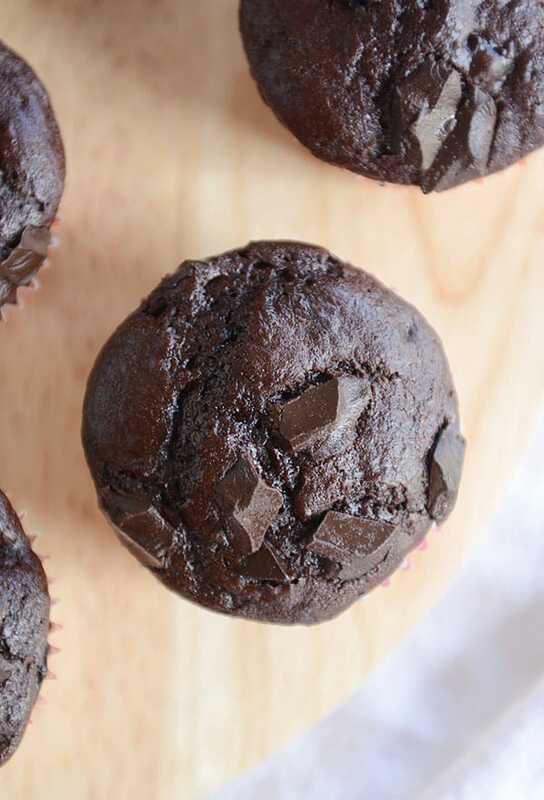 A deliciously simple recipe for homemade double chocolate muffins! Soft and fluffy with decadent morsels of chocolate thrown in the batter, they are perfect! I just feel like chocolate muffins sometimes have a hard life, you know? They are constantly criticized for being more cupcake than muffin; like, they can’t be appreciated for what they are. Well, I can only speak for the lovely muffins you see here today, but they are a deliciously decadent chocolate muffin loaded brazenly with chocolate chunks (ok, you can use chocolate chips if you have to, but I’m just saying for the record that chocolate chunks are 100% more fun) – and making no apologies about it! 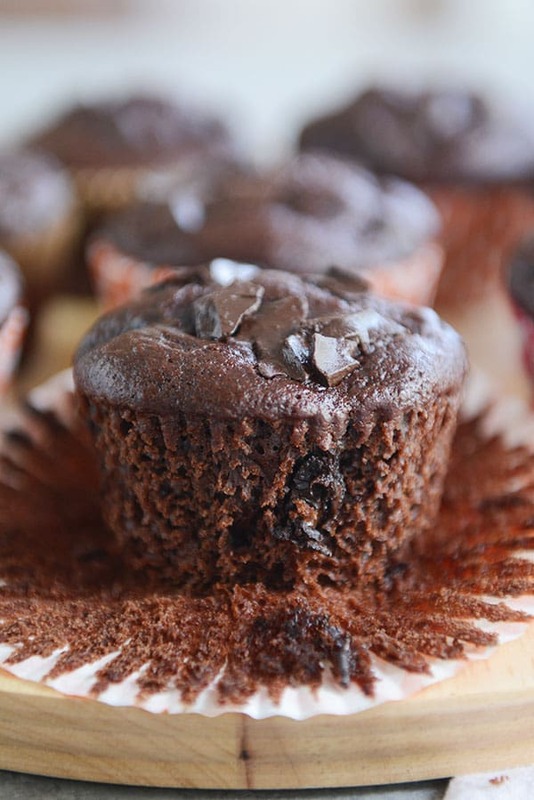 A bit sturdier than your average chocolate cupcake, these chocolate chunk muffins are still light and fluffy and wonderfully moist (sorry, but I felt that word was necessary here). How are these different than the other recipe I have for double chocolate muffins, you might ask? Well, for one: chocolate chunks (Trader Joe’s carries my favorite brand of chocolate chunks, BTW). Also, todays’ batch of muffins doesn’t make quite as many (about 12 compared to the old recipes’ 24+); your self-control can thank me later. Moreover, these chocolate chunk muffins have a slightly different flavor and texture thanks to the ingredient lineup. Honestly, they are just a bit better than those archived double chocolate muffins of my youth (er, I mean my early 30’s). These double chocolate chunk muffins I’m talking about today really are glorious. They bake up perfectly – such a beautiful muffin! Just like a gorgeous double chocolate chunk muffin from you know where (rhymes with Bostco), albeit slightly smaller, because eating muffins the size of your head may not always be the best idea. The batter comes together in a snap. You don’t even need a mixer, just some good old-fashioned whisking and stirring. Which means you probably know what I’m about to say here: so easy, my kids can make them. I don’t know about you, but that thought makes me extremely excited. I see a lot of double chocolate chunk muffins in my future. There are worse things (like the messy kitchen that will follow, actually). Preheat the oven to 375 degrees F (only 350 degrees F for dark coated muffin pans). Line the cups of a 12-cup muffin tin with paper liners. Set aside. In a large bowl, whisk together the flour, sugar, cocoa powder, baking powder, baking soda, and salt. Add the chocolate chunks and toss to combine. In a separate bowl (or in a large liquid measuring cup), whisk together the eggs, buttermilk, vanilla and oil. Fill the muffin cups evenly with batter and sprinkle the remaining chocolate chunks on top of each muffin. Bake for 15-17 minutes until the tops spring back lightly to the touch (don't overbake or they might be dry). Remove the muffins to a wire rack to cool completely. These muffins are very chocolatey. On purpose. If you want less chocolate goodness (gasp! ), you can cut down the amount of chocolate chunks (or chips) you are using. I'll leave those modifications up to you because in my world: the more chocolate, the better. Also, I've made these muffins lots of times with white whole wheat flour. They are slightly more dense but still delicious. When I use whole wheat flour, I make very sure not to overmeasure the flour as it absorbs more liquid than all-purpose flour. Love this recipe! Just wondering where you found the cute liners? I think I picked these up at Orson Gygi. These are amazing! So chocolatey and decadent. Thank you! Made them in a muffin pan and would’ve made more than 12 too. For some reason mine didn’t rise much. I swear my baking powder is not working as this is the second recipe I had this problem on. I made it with 1 cup wheat flour and about 3/4th cup all purpose flour and the milk/sour cream mix. Still tasted awesome and they were gone in 2 days! Ever considered replacing the oil with pumpkin or apple sauce to make them healthier? Am curious if you would have any recommendations? I haven’t tried replacing the oil but I bet you could experiment (applesauce would be my vote!). I just made these and they are indeed moist and delicious. Got a thumb’s up from the family!! This is definitely a keeper!!! 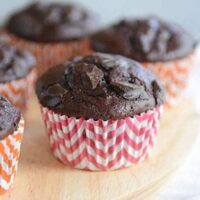 5 stars for being easy and hands down the best chocolate muffins I have ever had/made! My daughter is making these and thought that using sour cream was strange (since we don’t have buttermilk). But she said, “Ah, it’ll be fine. It’s Mel’s recipe!” Lol! I would really like to make these today but only have dutch process cocoa on hand. Would I be able to substitute it for the unsweetened cocoa in this recipe? I think it should work ok! Recipe worked out great! I used half almond milk and half sour cream for the buttermilk and the recipe made 6 jumbo muffins (baked to perfection for 22 minutes). They were better than the grocery store muffins I always loved so much! To save other high altitude Utahns any grief, I would recommend you not fit all the batter into 12 standard sized muffins unless you adjust the recipe for high altitude. I decided to bake it all in 12 muffins like Mel and it majorly overflowed all over my oven. I’m curious if it worked out for anyone else in Utah or high altitudes. I live in Northern Utah and this recipe made 24 decently large muffins. I didn’t dare try for 12. 12 jumbo maybe! We live at 6500 feet and I found that using whole wheat flour instead of white, plus baking at 425 for 5 minutes before lowering to 375 for the remaining time worked. I was a little nervous, the batter seemed funnier than the muffin recipes I usually use, but they came out amazing! 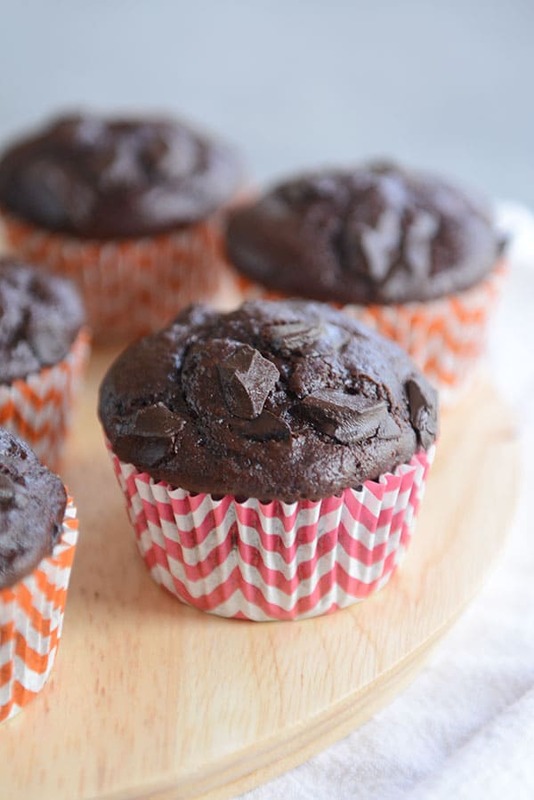 We really love these muffins–so chocolatey and a great texture. Could this recipe be converted to mini loaves? Would I only need to increase the baking time, or would I also need to tweak an ingredient? I don’t think you would need to change the ingredients, but you’d probably want to bake them longer…maybe start checking after about 25 minutes? Kids gave these “way more than 5 stars, Mom!”. Substituted Almond Milk and Vinegar for buttermilk. The recipe made 8 Texas -sized muffins (6 cup Muffin pan). Thank you for a delicious and easy recipe! 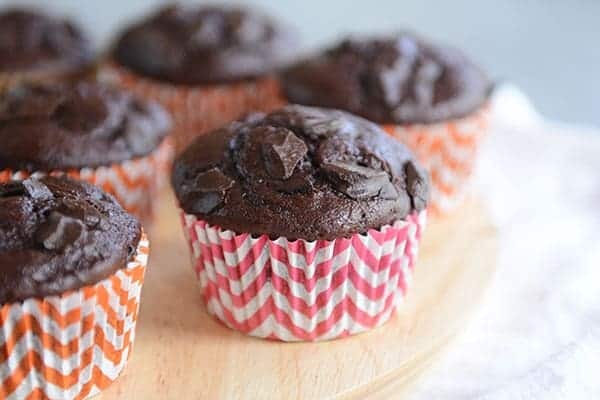 The very best double chocolate chunk muffins. Love it! Tastes great! Yields 1 1/2 dozen in a standard muffin pan. Thank you. I thought I was crazy when I had lots leftover after filling my dozen muffin cups. I’m so glad I found your page on Instagram! This muffin recipe is really amazing, I have already eaten 4 muffins, and the whole family loves them! It’s a new favorite! Thank you so much! Hi Mel, I use your website all the time for muffin recipes. Your new website design looks great! I use daily to use the ‘muffins’ tab in the recipe index to find the recipes I love to use, but you don’t seem to have a dedicated muffins area anymore, so I have to look through the desserts section to find what I’m looking for. You have cupcakes, bars and cookies tabs within the desserts section, but no muffins. Is it possible to have the option of looking specifically for muffins on this new website design? I’ve been wanting to make these for months and finally did this afternoon. They are incredible!! So super quick to put together and the taste is absolutely fantastic. My kids and their friend had them for an after school snack and the boys called them “life changing.” Too funny and I can’t really disagree! I filled the cups pretty full and got 21 beautiful muffins. Would I be able to use this recipe but instead of making muffins, name a cake instead? My dad’s grandmother had a recipe for chocolate chunk cake and i don’t know if this would work or just adding in chocolate chunks to a regular chocolate cake mix would work…advice??? I haven’t tried that, so I don’t know for sure. Sorry! I have to disagree with you on this one…these are WAY better than Costco’s. I used chocolate chips and filled the muffin tin to the top. They are so tender, have a nice shape, not too sweet and everyone loved them. Thanks Mel! I have lost count of how many times I have made these muffins since the recipe was first posted (as soon as I saw the picture I couldn’t stop thinking about them until I made them!). They are just as delicious as I thought they would be! I have substituted milk chocolate chips for the chocolate chunks when that was all I had on hand, and they are still excellent. Thanks for ANOTHER wonderful recipe!! Made these muffins for a die-hard Costco chocolate muffin fan. I had to use chocolate chips instead of chunks because that’s what I had, but they were absolutely amazing. I filled the cups completely to the top and got 19 beautiful sky-high muffins which taste even better than they look (which is amazing because they look DIVINE)! Thanks for the awesome recipe – and the Costco muffin die-hard has been converted to homemade! I got 6 jumbo and 12 regular size muffins. Very good and not overly sweet. Just made these muffins and they sure are Yummy! Problem is I’d eat them all in one sitting!! Could they be frozen do you think or would it ruin them? Also, I couldn’t see where I could email you for a recipe request, so I hope it’s ok to ask you here to find the best SUN DRIED TOMATO PESTO recipe. Costco sold some for a minute and it was sooooo yummy and I just couldn’t believe it when they stopped carrying it. I am asking you to find the best/make the best because a) you are my superior in the kitchen and b) when you find it all your people here will want to know about it. Have you made these with plain Greek yogurt? No, I almost always use buttermilk or whisk together milk or sour cream but I’m guessing it should work. Oh, and I agree, TJ’s chunks are really the best!! Just thought I would add for me this recipe made 12 heaping muffins. They are large, but I was able to fit the batter in. The bake time may need to be decreased if you go with 24 small muffins. Thanks for checking in, Sara! But where do I find Chocolate chunks? I don’t see them in the chocolate chip aisle and there isn’t a trader Joe’s close by. (Is there another brand that you recommend?) Maybe bulk section at Winco? Amazon? I feel like an idiot even asking…but I need these muffins! Hi Amber – Nestle has a brand of chocolate chunks (I know Walmart and my every day grocery store carries them by the chocolate chips). If all else fails, you can buy a bar of chocolate (usually above the chocolate chips) and chop it, but honestly, if that’s the case, I’d probably use chocolate chips as a sub. These are so good! I made them yesterday, and my kids *may have* had them for dinner. With your sour cream banana bread. 🙂 It was a baking day, and after taste testing everything, no one was hungry for real dinner. My muffins are also in the oven right now, but did you use a larger than normal sized muffin pan because there is no way I could have gotten 12 regular muffins out of this batch? I have quite a bit of batter left over and that is afternoon overfilling my tins. Hey Becca, yeah, sorry about that. I replied to someone else’s comment above about this. I think when I was testing this recipe, I halved it and that’s when I got the 12 muffins. I’ve edited the notes of the recipe to show that it makes more than 12. The universe wants me to make muffins. Yesterday my son read a story aloud about muffins and my daughter asked, “Can we make muffins?” And five minutes later the muffin pan fell out of the cupboard onto my foot. No lie. I said, “Maybe this weekend.” Then I get on your blog today (because I love it), and it’s muffins. Muffins are happening. Maybe they’ll be a new General Conference tradition. Thanks! Oh my gosh, this made me laugh (although sorry about the muffin pan foot incident). Hmmm, now you have me thinking that maybe when I calculated the 12 muffins it was when I had halved the recipe. Looks like I’ll be making them again tomorrow to see! 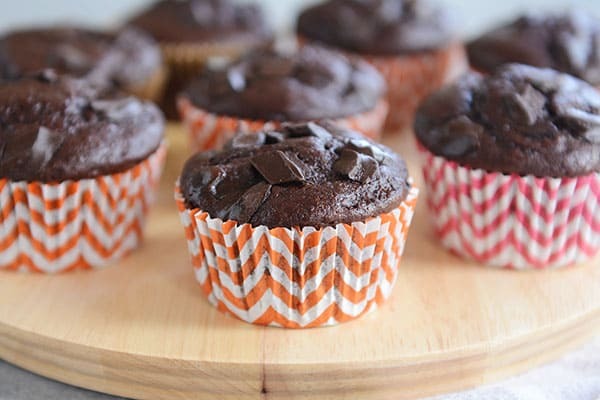 I’ve never actually had a chocolate muffin before, but these look amazing! These look delicious. I need to make a trip to Trader Joe’s for some of their choc. chunks. mmm. Oooh, so excited for these. I haven’t had any success in finding a good recipe for double chocolate muffins. I’ve tried more than one that look good, but really don’t taste good. But I know your recipe won’t let me down! WIN!! P.S. Are you willing to send me milk kefir grains?? I’ll pay shipping. Same here, I’d love some kefir grains! Hi Mary – like I mentioned to Stacey above, my kefir grains are in short supply right now. Touch base in a few weeks and if they’ve multiplied and replenished the earth (er, milk), I’ll send some along! Hey Stacey – I can definitely send kefir grains but after my kefir post last week, my grains are depleted. 🙂 I’ve given them out to several family members and friends since then so I need to build them up again (and it will take a few weeks). Touch base with me in the next few weeks, is that ok? Sounds great! Thanks much Mel. I’ve got a friend here that wants to do kefir too, so you could help 2 sisters out by sending 1 supply!